There are a number of musical instruments that require the use of talented hands to bring out the beautiful music. 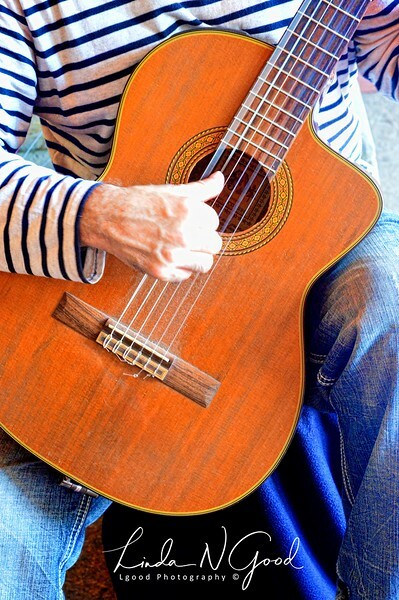 Music from guitars, pianos, organs, banjos, violins, drums and more are the result of talented hands. I’ve always been fascinated by watching a person’s hands as they play their chosen instrument. These hands were seen in NYC and belonged to a gentleman that was playing a beautiful Spanish tune. I have long admired the sounds of the Spanish guitar songs, and he was really good. We enjoyed listening for a few minutes. Have a day full of music or other activities that you love! The guitar - have never been the same since hearing Hendrix, Stevie-Ray and Peeter Green.... Lovely shot too !! Awesome capture & comp Linda! Wonderful capture of a master stroking his strings.